The primary treatment goal in ET is the reduction of platelet count below the diagnostic threshold and resolution of the clinical presentation. The treatment choice for high-risk ET patients involves the combined use of antiplatelet and cytoreductive therapies (hydroxycarbamide and anagrelide) as the first-line treatment, while interferon-α and busulfan are as second-line treatment. There has also been recent development of molecularly targeted JAK2 inhibitors as third-line treatment. In this article, we explored the diagnosis and management of ET in a resource-limited country like ours characterized by limited access to more recent molecular diagnostic methods and newer therapeutic modalities as obtained in developed countries. This is a retrospective study of seven referred ET patients (four males and three females) managed at the Haematology Department of the University College Hospital, Ibadan, within a 3-year period (2014–2016). 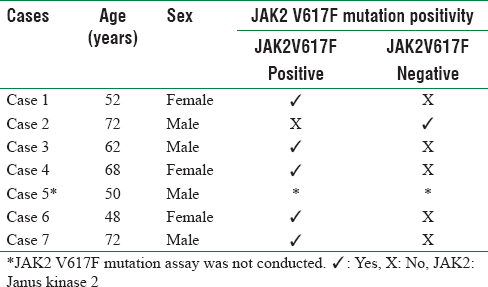 The demographic presentation of the patients along with their JAK2 V617F mutation status is shown in [Table 1]. There was a higher male preponderance (57.14%; 4/7) compared to the females (42.86%; 3/7). The median age at diagnosis was 62 years (range 48–72 years). Of seven patients, five were JAK2 V617F positive while one out of seven was negative, and the last patient (1/7) could not afford the test. BCR-ABL mutation assay was not conducted in all, but in one patient (conducted in the United Kingdom before the patient relocated to Nigeria) due to the cost and lack of easy assay accessibility. The clinical features at presentation are shown in [Table 2]. The most prevalent symptoms were fatigue, intermittent claudication, headache, and dizziness. One of the patients had transient ischemic attack, another patient had extensive proximal DVT, and a third patient had decreased libido and evidence of inferior vena cava (IVC) thrombosis. Hypertension was the most common sign occurring in 5 (71.4%) patients, 2 (28.6%) had hepatomegaly, and only 1 (14.3%) had splenomegaly at presentation. Sickle cell disease was excluded by a detailed history and peripheral blood film examination. The full blood count evaluation at diagnosis [Table 3] revealed a median hematocrit of 41% (range 35%–60%), the median WBC count of 7.3 × 109/L (range 5.4–12.5 × 109/L), and the median initial platelet count of 962 × 109/L (range 660–3770 × 109/L). The bone marrow aspiration cytology evaluated at presentation revealed hypercellular marrow with megaloblastic erythropoiesis of the bone marrow as a common presentation in the sampled cases [Table 4]. Bone marrow trephine biopsies for histology were not done. All but one of the patients were placed on cytoreductive therapy using hydroxycarbamide at a dose of 1–2 g as the first-line therapy along with antiplatelet therapy with clopidogrel. Case 1 at baseline was placed on pegylated interferon-α at 90 μg weekly and she had two doses. She subsequently commenced hydroxycarbamide at 500 mg twice daily for 5 months. Interferon-α therapy was recommenced thereafter at 90 μg weekly because of fertility concerns. One of the patients, Case 2, with an initial platelet count of >3000 × 109/L, developed peripheral neuropathy on hydroxycarbamide and was converted to interferon-α. However, he developed flu-like symptoms necessitating cessation of the therapy and recommencement of hydroxycarbamide at a lower dose (500 mg twice daily). No psychiatric effects were observed in the patients while taking interferon-α. In all, two patients had pegylated interferon-α during their treatment. The serial full blood count of these patients was also evaluated to assess the hematological changes in the patients following therapy [Table 5] and [Figure 1]. Nigeria, a middle-income resource-limited country, is faced with the perennial problem of inadequate access to medical care and appropriate facilities necessary for the management of many medical conditions including hematological neoplasms. This study comprises a report of seven ET patients, their hematological changes, and clinical features through their management using available resources at our disposal. Patients may present at any age, although ET is largely a disorder of later years with a peak incidence between the ages of 50 and 70 years. The median age at diagnosis of the patients in this cohort (62 years) is similar to previously reported findings., This highlights the age-associated preponderance of the diagnosis of ET in older patients. In addition, 3 (42.86%) of the 7 patients studied were below 60 years of age which further underscores the possibility of presentation at any age. In our report, there appears to be a slight male preponderance compared to the female-reported cases. This finding is, however, different from previously documented reports of a higher prevalence of ET in females, and this could be ascribed to the small number of cases considered in this study. Two cases with hepatomegaly were reported in this study, while one had mild splenomegaly. These findings in our study are consistent with the report of variable prevalence of mild hepatomegaly and splenomegaly as important clinical features associated with ET.,,, The relatively small sample size and the occurrence of IVC thrombosis in one of our patients may have accounted for the prominence of hepatomegaly in our cohort. A recurring clinical sign was hypertension which had found in 6 (85.7%) out of 7 patients and was managed along with the ET treatment. This finding is consistent with the documented presentation of hypertension as a major complication in the MPNs and ET. Hypertension as a complication also plays an important role as a predisposing risk factor responsible for the thrombotic cardiovascular events associated with ET.,, Other studies have also reported the combined role of ET and hypertension as an associated factor responsible for renal vascular stenosis. Apart from the management practice in this report, another major consideration is the availability of resources and appropriate facilities in the management of these cases. This is exemplified by the unavailability of cytogenetics and molecular assay facilities for MPN-associated mutations (such as MPL, TET, and CALR). These tests would have been crucial in further characterizing the MPN clinical entity. The significant role of the patients' socioeconomic status was also a major consideration in their inability to finance some of the recommended tests, while just one patient was able to perform the BCR-ABL 1 mutation test (for CML exclusion) conducted in a medical facility outside the country. This highlights the impact of patients' socioeconomic status and resources on their treatment and compliance to the recommended management practices. This is worsened by the overreliance of the Nigerian health-care system on out-of-pocket payment system and the poor enrolment of Nigerians in the National Health Insurance Scheme., This has been reported to further worsen the level of poverty and health inequalities among the different social classes consequent on managing a resource-intensive condition like ET. With the recent increase in the body of knowledge on the molecular basis of ET and other MPNs, there is a need for the availability of modern diagnostic facilities to ensure evaluation of other molecular markers apart from JAK2. This would also help reduce the underreporting of ET cases as the diagnosis of many cases could be missed due to poor access to full complement of the necessary test facilities. More so, the incorporation of other adjunct diagnostic procedures such as bone marrow studies for iron stain, marrow fibrosis, and cytogenetic analysis will be crucial for appropriate prognostication and risk stratification of cases. This would be essential in providing more robust information that will help in treating and monitoring these patients. While the practicality of having a full complement of the diagnostic test facilities available in health-care facilities might not be possible in resource-limited areas, the use of the diagnostic criteria in case ascertainment would however result in ease of case identification and early institution of appropriate management. Furthermore, the availability of novel therapy with JAK2 inhibitors may confer a better prognosis while also limiting the adverse effects associated with hydroxycarbamide therapy. The authors will like to acknowledge Adewole A Adekola (DVM, MV. Sc, MPH) for his input in the writing of the report. Keohane C, Harrison C. Essential thrombocythemia: New advances in an old disease. Clin Invest 2012;2:603-14. Available from: http://www.openaccessjournals.com/articles/essential-thrombocythemia-new-advances-in-an-old-disease.pdf. [Last cited on 2018 Apr 05]. Barbui T, Thiele J, Gisslinger H, Finazzi G, Vannucchi AM, Tefferi A, et al. The 2016 revision of WHO classification of myeloproliferative neoplasms: Clinical and molecular advances. Blood Rev 2016;30:453-9. Chauffaille M. Myeloproliferative neoplasms: A review of diagnostic criteria and clinical aspects. Rev Bras Hematol Hemoter2010;32:308-16. Available from: http://www.scielo.br/pdf/rbhh/v32n4/en_aop90010.pdf. [Last cited on 2018 Apr 10]. Rumi E, Cazzola M. How I treat essential thrombocythemia. Blood 2016;128:2403-14. Briére JB. Essential thrombocythemia. Orphanet J Rare Dis 2007;2:3. Available from: http://www.ojrd.biomedcentral.com/articles/10.1186/1750-1172-2-3. [Last cited on 2018 Apr 05]. Cervantes F. Management of essential thrombocythemia. Hematology Am Soc Hematol Educ Program 2011;2011:215-21. Harrison CN, Campbell PJ, Buck G, Wheatley K, East CL, Bareford D, et al. Hydroxyurea compared with anagrelide in high-risk essential thrombocythemia. N Engl J Med 2005;353:33-45. Tefferi A, Barbui T. Personalized management of essential thrombocythemia-application of recent evidence to clinical practice. Leukemia 2013;27:1617-20. Hernández-Boluda JC, Alvarez-Larrán A, Gómez M, Angona A, Amat P, Bellosillo B, et al. Clinical evaluation of the European leukaemiaNet criteria for clinicohaematological response and resistance/intolerance to hydroxycarbamide in essential thrombocythaemia. Br J Haematol 2011;152:81-8. Sambo M, Ejembi C, Adamu Y, Aliyu A. Out-of-pocket health expenditure for under-five illnesses in a semi-urban community in Northern Nigeria. J Community Med Prim Health Care 2005;16:29-32. Available from: https://www.pdfs.semanticscholar.org/336b/28c5e44fc26f67917a3e32b1872394f94fd7.pdf. [Last cited on 2018 Apr 18]. Aregbeshola BS. Out-of-pocket payments in Nigeria. Lancet 2016;387:2506. Available from: http://www.thelancet.com/pdfs/journals/lancet/PIIS0140-6736(16)30798-X.pdf. [Last cited on 2018 Apr 18]. Tefferi A, Pardanani A. Myeloproliferative neoplasms: A Contemporary review. JAMA Oncol 2015;1:97-105. Leroy E, Constantinescu SN. Rethinking JAK2 inhibition: Towards novel strategies of more specific and versatile janus kinase inhibition. Leukemia 2017;31:1023-38. Levine RL, Wadleigh M, Cools J, Ebert BL, Wernig G, Huntly BJ, et al. Activating mutation in the tyrosine kinase JAK2 in polycythemia vera, essential thrombocythemia, and myeloid metaplasia with myelofibrosis. Cancer Cell 2005;7:387-97.